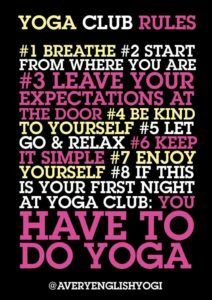 The 7th Yoga Club Rule is another simple one. The rule is simply to enjoy yourself. This sounds more straight forward than it is though. Which is why I put a question mark after “enjoy yourself”. There are quite a few people who still quite like to feel “the burn”, and to feel pain. You might be one of them. I’m not against a little bit of extension or effort, but I don’t think the “if it isn’t hurting: it isn’t working” thing is particularly helpful when it comes to yoga and yoga club. I don’t like grimacing and I don’t like to see suffering. There’s enough of that in the world as it is. So what do I mean by “enjoy yourself”? I guess my nearest cross reference is the wonderful idea of santhosha. This crops up in the Yoga Sutras, authored by Patanjali. It translates as: complete contentment, and can be considered as contentment with one’s particular circumstances. I guess it’s a degree of acceptance. And that is where it is ideal for yoga. When we do a forward bend – seated (paschimottasana) or standing (uttanasana) we can simply go as far forward as feels comfortable and we can be content with that. Or we can push and push and push and maybe strain and maybe we run the risk of pulling something and hurting ourselves. We might find that our ego comes into play with this too. We look to the teacher, or our neighbouring aspirant and see that they can progress further than us. We might then try to compete and push and push more and more – to try to match or go beyond those who we see do this. In that direction, it may well end up hurting, but in the long run – it won’t be working. In many ways if we approach yoga, and pretty much most things, with a sense of contentment or acceptance about who we are, and how our body, and mind is, this will help. I like to think that our approach is like a happy go lucky child walking along the road to school and enjoying the day and the walk as it happens. The child sees a beautiful magpie squawking on the roof of a building and appreciates it but equally appreciates that he or she cannot climb up the building to the roof to get closer. So observes for a moment and then continues along in a happy go lucky kind of way. It’s a simple analogy but hopefully it is helpful. Translated to yoga practice it means that we accept our limitations and appreciate ourself as we are. We observe what is happening without getting enmeshed in the drama of each and every happening. In the postures, or breathing or any of the other practices of yoga, we go as far as we are able to and enjoy the range of movement, appreciating any benefits that it confers upon us. In turn, we may view others who are far superior in their range of movements and we simply appreciate this. We don’t get enmeshed in our views of them or of us – or both. As such we appreciate and carry on with our practice, rather than try to match or better theirs. So, the key is to enjoy yourself in a quiet, contented, grateful kind of way and not in a rah rah rah party party party kind of way. Partying, maybe for another time. Enjoy the experience of practicing postures (asana) and working with your breath and mind. And most of all – enjoy practicing yoga.